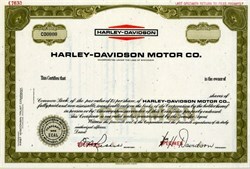 Beautifully engraved RARE SPECIMEN certificate from the Harley - Davidson Motor Co. This historic document was printed by the American Banknote Company and has an ornate border around it with a vignette of the company logo. This item has the printed signatures of the Company’s President ( W. H. Davidson ) and Secretary. William H. Davidson became president of Harley - Davidson Motor Co. in 1942 and retired in 1973. He was also elected to The Motorcycle Hall of Fame 1999 which include those who have excelled in motorcycle business, history, design and engineering, in addition to those known for their contributions to road riding, off-road riding and all categories of motorcycle racing.